SUSTAINABILITY is one of the issues the Swiss Open Cultural Data Hackathon is dealing with: What happens to the hackathon projects after the hackathon? How to ensure that the projects are further developed and not fully abandoned? How to make them known to a broader audience? The “Long Nights of Museums”, which take place in different cities of Switzerland throughout the year, provide interesting platforms to investigate the sustainability of hackathon projects and the reception they get from the audience. It’s Friday evening in mid-January. The nave of the Barfüsserkirche, home to Basel’s Historical Museum, is barely recognisable: a cloud of white balloons is floating over the medieval sculptures gathered next to the stage hosting the numerous performances of the night. The light is dimmed, the music is not. Right by the entrance, people wearing virtual reality glasses are immersed in an invisible space. They are visiting a virtual exhibition. Photo: Databases and Information Systems (DBIS) Group, University of Basel. The virtual exhibition is a new version of a project developed at our 2018 GLAMhack at the Swiss National Museum. “Walking around the Globe – VR Picture Expedition”, as it was originally entitled, had won the “Brand New” category of the GLAMhack Awards. 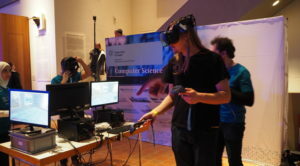 Some of the project team members, all affiliated to the “Computer Science” studies at the University of Basel, took the initiative to present their project at the Long Night of Museums. The initial exhibition was widely modified as the original exhibits were replaced by artefacts from the Historical Museum’s own collections: photographs, prints and paintings which all show the Barfüsserkirche. In addition to the images, the museum provided explanatory labels, which were “hung” next to the exhibits on the virtual walls. In order to inform the visitors about the context in which the project was developed as well as the OpenGLAM ideology and goals, OpenGLAM.ch organised a stand with posters listing the five principles of OpenGLAM. 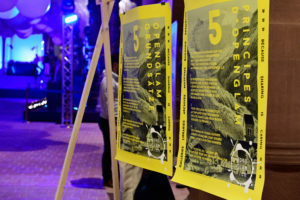 Videos of the final presentations of the 2018 hackathon projects were shown on a screen and the visitors could take home postcards with information about OpenGLAM.ch. Many people showed interest in what OpenGLAM stands for. Photo: Historisches Museum Basel, Natascha Jansen. The Long Night of Museums seems an ideal platform to engage an audience with interactive projects, especially those involving new technologies such as VR glasses. The VR exhibition was a big success telling from the people queuing to try it out. In this case, the event also provided a motive for the team to further develop their project, using new data and working with new partners. The “Walking around the Globe – VR Picture Expedition” is therefore a very nice example of the life of a hackathon project after the hackathon. The Long Night of Museums in Basel took place on Friday 18 January 2019. 10’000 visitors came to the Barfüsserkirche between 18h and 4h. What happens when heritage institutions such as museums, libraries and archives come together with software developers, researchers, Wikipedians and designers to investigate the potential of digital cultural heritage and more specifically of open cultural data? Some answers to this question have emerged during the yearly Swiss Open Cultural Data Hackathon, which took place at the Swiss National Museum from 26 to 28 October. 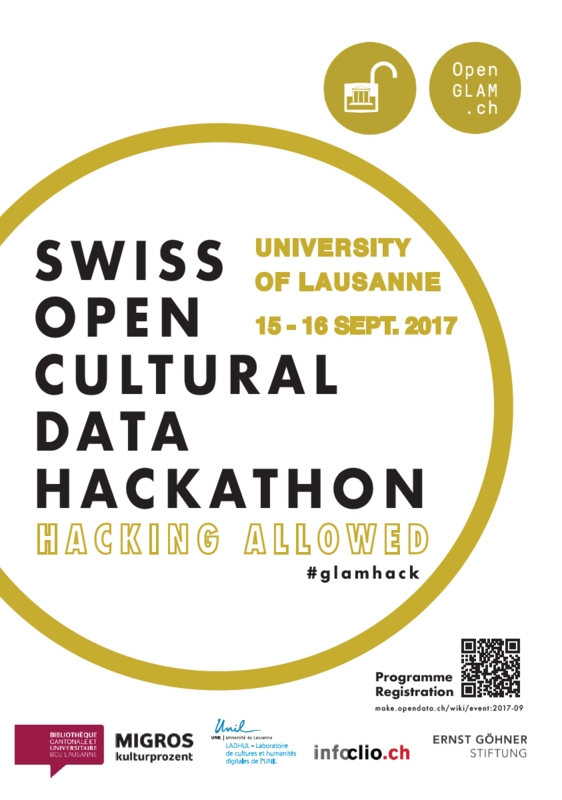 For the first time, the Swiss Open Cultural Data Hackathon was accompanied by a public event during which the projects were presented to an audience and subsequently evaluated. The visitors could try out what the teams had put together during the weekend and vote for their favourite project. A jury of six professionals working in heritage institutions or in the field of open data and computer science selected the best projects in three categories focusing on the greatest gain of knowledge provided, on the best approach used to highlight a dataset and on innovation. In total, twelve projects were presented during the awards. They are presently at the mockup or prototype stage and will hopefully be further pursued over the coming months. The project enabling the greatest gain of knowledge is a mobile application conceived for art museums. “Ask the Artist” functions with voice assistance and gives visitors the opportunity to have a conversation with an artist. When standing in front of a painting for example, the visitor can ask the author questions such as “What is the subject of your painting?”, “When did you start painting?” or “Who taught you painting?”. The answers are drawn from the museum’s database – or in this specific case from the SIKART online Lexicon on Swiss art – and read out loud by the mobile phone. Contrarily to voice assistance devices which draw information from the internet, the data provided by “Ask the Artist” comes from secure sources and guarantees reliable information. The jury particularly appreciated this application because it enables the audience to gain information in a very natural and intuitive way. The project was also chosen by the audience as the “biggest round of applause”. “Zurich Historical Photo Tours” is the project that best highlights open cultural datasets. This mobile application takes the visitor on a journey through Zurich’s history by proposing themed tours based on historical photographs from the collections of the Zentralbibliothek Zurich and the Swiss National Museum. After choosing a theme, the users are shown where to go on their mobile map. Once they reach the given perimeter, a historical photograph of the place appears on their phone. The users can take their own picture of the location and layer the old and new photos to compare them. They can get further information about the location by sending their photo using the application. “Zurich Historical Photo Tours” puts historical photographs back into their geographical context and creates a dialogue with the present. It permits the audience an interactive outdoor experience. The project group imagined a further function for the application, allowing the users to identify old photographs which have not yet been localised with geo data. The most innovative and independent project is “Walking Around the Globe – a VR Picture Expedition”. The team created a virtual exhibition space which could be visited with Virtual Reality glasses. One of the two exhibition rooms is themed around a globe from the Sternwarte collection of the ETH Zurich. Thanks to 360° photographs of the object, a 3D model could be visualised in the centre of the room. On the walls the visitor can look at works from the Graphische Sammlung of the ETH, all having a thematic link to the globe. An audio-guide integrated in the glasses provides information on the works. The ideas behind “Walking Around the Globe” are diverse. For museum professionals, it provides a tool to visualise spaces during the preparation of an exhibition. Virtual exhibitions also permit to show works which cannot usually be presented because of conservation issues or simply a lack of space in the museums. For the audience, this project gives the opportunity to step in the mind of a curator and put together one’s own exhibition. At infoclio.ch’s hackathon reporting page you can find the video recordings of the project presentations. A complete list of Hackathons projects as well as a list of available datasets can be found on the OpenGLAM Hackathon website. GLAMhack 2018 – Sign up now! This year’s Swiss Open Cultural Data Hackathon takes place on 26-28 October 2018 at the Swiss National Museum in Zurich – in cooperation with the ETH Library, Zentralbibliothek Zürich, the Swiss Social Archives, the State Archives of the Canton of Zurich, the Basel Historical Museum, Wikimedia CH, and infoclio.ch and with the support of various sponsors. This year’s focus is on creating softwares or artefacts that engage an audience – either online or in form of exhibits/installations. We thereby also encourage the use of non-standard hardware, such as virtual reality equipment and the like – if you have any suggestions in this area, please get in touch! The two hackathon days are followed by a public project presentation event on Sunday afternoon, where visitors will have the possibility to test the products and to meet their creators. We will also award symbolic prizes to the best projects in several categories. – The GLAMhack Awards! To see the other videos, have a look directly at the infoclio.ch page. Join the „Friends of OpenGLAM“ Network! You can now support the cause of OpenGLAM in Switzerland by joining the „Friends of OpenGLAM“ Network! – It is meant to give our movement a stronger foundation by bringing the people behind it to the fore, and by securing the long-term financial viability of our activities. 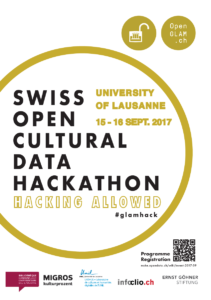 Registration for the third Swiss Open Cultural Data Hackathon is open. This year’s event takes place on 15-16 September 2017 (some workshops starting on the 14 September already). It is hosted by the University of Lausanne and supported by the Bibliothèque cantonale et universitaire de Lausanne, by the Laboratoire de cultures et humanités digitales (LADHUL), Infoclio.ch, Ernst Göhner Foundation and Migros Kulturprozent. Participants are asked to sign up by the end of August 2017: Programme & Registration. Archival Hackday in Zurich – Sign up now! Sign up now for the Open Archival Hackday that will take place on Friday, 9th June at the Zurich Cantonal Archives. The event is organized by several archives of the Zurich region in cooperation with OpenGLAM CH and the Association of Swiss Archivists. For the programme & registration information, refer to the event page! The datasets made available for this occasion are available here.